Foldable phones – at least in terms of a modern flagship – are something we haven’t seen from the market so far. At this point, it’s unclear as to how exactly the foldable phones will be implemented, with multiple patents filed at this point that suggest different possible designs. What we do know, however, is that the Galaxy X will offer something new in a market with high-end phones that are looking increasingly similar. Whether these foldable phones are gimmicks or the future of smartphones remains to be seen, but the fact remains that it will be a breath of fresh air. The Galaxy X will be a step forward for Samsung, but the rest of their lineup seems to suggest that their “efforts to differentiate [their] smartphones by adopting cutting-edge technologies” isn’t being extended to all of their phones. The Galaxy S9 has had most of its specifications leaked – despite the fact that the phone hasn’t even been announced yet – and it has been on the receiving end of a decent amount of criticism due to the lack of significant upgrades over the S8. Sure, the S9 offers some notable power upgrades and some newer camera technology, but it ultimately looks and behaves almost exactly as its predecessor did. In a market currently dominated by the iPhone X, the lack of innovation with the S9 is certainly concerning. The Galaxy X will be the third entry into Samsung’s product family of high-end phones. The S and Note lines will continue to be more traditional phones – at least for now – while the Galaxy X offers a novel new device for those interested in foldable phones. If the future is truly in foldable phones, however, we may see this technology rolled over into their main flagships. For now, though, we just have the Galaxy X to look forward to and the new features it will bring to refresh Samsung’s line. As far as what we know about Samsung’s foldable phones, there were patents filed in both 2016 and 2017 that show several variations on a flexible display. 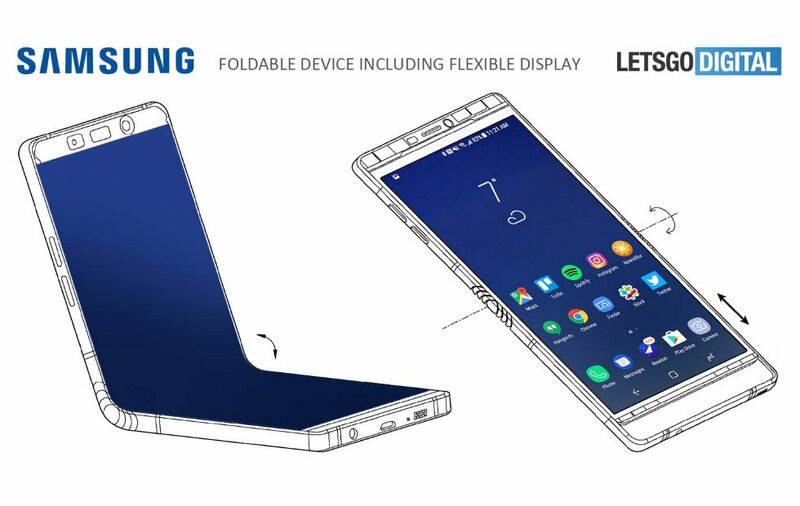 Ranging from a wraparound display to a large and flexible screen, there have been multiple iterations discovered through looking for patents so we’re not exactly sure what kind of foldable phones we’ll see from Samsung moving into the next few years. However, industry insiders and smartphone experts believe that we may see the Galaxy X as soon as December of 2018, with a lunch by early 2019 almost guaranteed. While the Galaxy X foldable phones will be first high-end mobile devices with such a technology, foldable OLED screens aren’t anything new by any means. Samsung and LG are the major players when it comes to this technology, alongside Chinese manufacturer BOE. All three companies have curved OLED displays already released, with products such as monitors and TVs to curved smartphones such as the Galaxy edge and LG Flex. While we have these curved displays already, actual foldable phones will be a first. Samsung has been spending a lot of time and resources on the path towards truly foldable phones over the last few years, with some sort of flexible tech in development since 2011. This research led to the development of the Galaxy Round back in 2013, the Galaxy Edge in 2015 and 2016, and now the steady progress towards the release of the Galaxy X foldable phones. Ever since the display of the rollable OLED screen in 2016 as part of their “Project Valley” (the codename for the Galaxy X), rumors have been flying around regarding the release of the upcoming phone. Only now have we received more concrete news from those in-the-know, with news of a release date coming sooner rather than later. It will be interesting to see how the Galaxy X performs when compared to the main lines of the S and Note models. With a Galaxy Note 9 release expected near the end of 2017, the Galaxy X may face some competition from within in addition to the threat of the looming release of Apple’s latest flagships. While the Galaxy X may offer some well-needed innovation for the Samsung line, foldable phones may not be enough to threaten the dominance of Apple when it comes to western sales. With the release of the iPhone X, Apple proved that the market appreciates innovation, and they saw great success with the fastest-selling iPhone in history. Sales have since dropped off, but we can expect the FaceID technology to ship on all upcoming Apple flagships. The first of the Samsung foldable phones may provide a worthy competitor for Apple devices, but if Samsung is not able to commit to offering innovative technology in their other lineups, we may see the company pale in comparison to Apple – at least in the Western market.